This article is about the disease in dogs. For the disease in humans, see Hip dysplasia. For the disease in other animals, see Hip dysplasia § Other animals. In dogs, hip dysplasia is an abnormal formation of the hip socket that, in its more severe form, can eventually cause crippling lameness and painful arthritis of the joints. It is a genetic (polygenic) trait that is affected by environmental factors. It is common in many dog breeds, particularly the larger breeds, and is the most common single cause of arthritis of the hips. In the normal anatomy of the hip joint, the root (the thigh bone) is connected to the pelvis at the hip joint. The almost spherical end of the femur head (the caput, or caput ossis femoris) fits into the acetabulum (a concave socket located in the pelvis). The bony surfaces of the femur head and of the acetabulum are covered by cartilage. While bones provide the strength necessary to support body weight, cartilage ensures a smooth fit and a wide range of motion. Normal hip function can be affected by congenital conditions such as dysplasia, discussed in this article, trauma, and by acquired diseases such as osteoarthritis and rheumatoid arthritis. The hip could have major contractions or seizures from dysplasias. The caput is not deeply and tightly held by the acetabulum. Instead of being a snug fit, it is a loose fit, or a partial fit. Secondly, the caput or acetabulum are not smooth and round, but are misshapen, causing abnormal wear and tear or friction within the joint as it moves. The body reacts to this in several ways. First, the joint itself is continually repairing itself and laying down new cartilage. However, cartilage repair is a relatively slow process, the tissue being avascular, so the joint may suffer degradation due to the abnormal wear and tear, or may not support the body weight as intended. The joint becomes inflamed and a cycle of cartilage damage, inflammation and pain commences. This is a self-fueling process, in that the more the joint becomes damaged, the less able it is to resist further damage. The inflammation causes further damage. The bones of the joint may also develop osteoarthritis, visible on a radiograph as small outcrops of bone, which further degrade the joint. Osteoarthritis is a degenerative disease marked by the breakdown of cartilage between joints resulting in painful bone-to-bone contact. The underlying deformity of the joint may get worse over time, or may remain static. A dog may have good radiographs and yet be in pain, or may have very poor radiographs and have no apparent pain issues. The hip condition is only one factor to determine the extent to which dysplasia is causing pain or affecting the quality of life. In mild to moderate dysplasia it is often the secondary effects of abnormal wear and tear or arthritis, rather than dysplasia itself, which is the direct causes of visible problems. Hip dysplasia may be caused by a femur that does not fit correctly into the pelvic socket, or poorly developed muscles in the pelvic area. Large and giant breeds are most susceptible to hip dysplasia (possibly due to the body mass index (BMI) of the individual animal), though many other breeds can suffer from it. The Orthopedic Foundation for Animals maintains a list of top 100 breeds affected. To reduce pain, the animal will typically reduce its movement of that hip. This may be visible as "bunny hopping", where both legs move together, or less dynamic movement (running, jumping), or stiffness. Since the hip cannot move fully, the body compensates by adapting its use of the spine, often causing spinal, stifle (a dog's knee joint), or soft tissue problems to arise. The causes of hip dysplasia are considered heritable, but new research conclusively suggests that environment also plays a role. To what degree the causality is genetic and what portion environmental is a topic of current debate. Neutering a dog, especially before the dog has reached an age of full developmental maturity, has been proven to almost double the chance he or she will develop hip dysplasia versus intact dogs or dogs that were neutered after reaching adulthood  Other environmental influences include overweight condition, injury at a young age, overexertion on the hip joint at a young age, ligament tear at a young age, repetitive motion on forming joint (i.e. jogging with puppy under the age of 1 year). As current studies progress, greater information may help provide procedures to effectively reduce the occurrence of this condition. The problem almost always appears by the time the dog is 18 months old. The defect can be anywhere from mild to severely crippling, and can eventually cause severe osteoarthritis. It is most common in medium-large pure bred dogs, such as Newfoundlands, German Shepherd Dogs, retrievers (such as Labradors, Tollers, or Goldens), rottweilers and Mastiff, but also occurs in some smaller breeds such as spaniels and pugs. "Traditionally, the signs of hip dysplasia are rarely extreme. Usually, only mild to moderate lameness is noted which may suddenly worsen. Dogs with a cranial (anterior) cruciate ligament tear typically hold the affected leg up (which is unusual with hip dysplasia). Patients with back (spinal) problems often scuff their toenails when walking, have an uncoordinated gait, and are weak in the rear limbs. They may be very painful if they have a disc rupture (sciatica) or show no spinal pain in certain degenerative spinal cord conditions (German Shepherd myelopathy)." Petplan Australia reported that signs of arthritis in dogs and cats include stiffness, difficulty moving, lethargy, irritability, and cat or dog may lick, chew or bite at sore joints. The classic diagnostic technique is with appropriate X-rays and hip scoring tests. These should be done at an appropriate age, and perhaps repeated at adulthood - if done too young they will not show anything. Since the condition is to a large degree inherited, the hip scores of parents should be professionally checked before buying a pup, and the hip scores of dogs should be checked before relying upon them for breeding. Despite the fact that the condition is inherited, it can occasionally arise even to animals with impeccably hip scored parents. A dog may misuse its rear legs, or adapt its gait, to compensate for pain in the forelimbs, notably osteoarthritis, osteochondritis (OCD) or shoulder or elbow dysplasia, as well as pain in the hocks and stifles or spinal issues. It is important to rule out other joint and bodily issues before concluding that only hip dysplasia is present. Even if some hip dysplasia is present, it is possible for other conditions to co-exist or be masked by it. If the problem cannot be controlled with medications, then often surgery is considered. There are traditionally two types of surgery - those which reshape the joint to reduce pain or help movement, and hip replacement which completely replaces the damaged hip with an artificial joint, similar to human hip replacements. Non-surgical interventions include three elements: weight control, exercise control, and medication. Canine massage may alleviate discomfort and help move lymph and nutrients through the system. Weight control is often "the single most important thing that we can do to help a dog with arthritis", and consequentially "reducing the dog's weight is enough to control all of the symptoms of arthritis in many dogs". Reasonable exercise stimulates cartilage growth and reduces degeneration (though excessive exercise can do harm too), and also regular long walks in early or mild dysplasia can help prevent loss of muscle mass to the hips. Medication can reduce pain and discomfort, and also reduce damaging inflammation. Non-surgical intervention is usually via a suitable non-steroidal anti-inflammatory drug (NSAID) which doubles as an anti-inflammatory and painkiller. Typical NSAIDs used for hip dysplasia include carprofen and meloxicam (often sold as Rimadyl and Metacam respectively), both used to treat arthritis resulting from dysplasia, although other NSAIDs such as tepoxalin (Zubrin) and prednoleucotropin ("PLT", a combination of cinchophen and prednisolone) are sometimes tried. NSAIDs vary dramatically between species as to effect: a safe NSAID in one species may be unsafe in another. It is important to follow veterinary advice. Carprofen, and other anti-inflammatories in general, whilst very safe for most animals, can sometimes cause problems for some animals, and (in a few rare cases) sudden death through liver toxicity. This is most commonly discussed with carprofen but may be equally relevant with other anti-inflammatories. As a result, it is often recommended to perform monthly (or at least, twice-annually) blood tests to confirm that the animal is not reacting adversely to the medications. Such side effects are rare but worth being aware of, especially if long-term use is anticipated. Some attempts have been made to treat the pain caused by arthritic changes through the use of "laser therapy", in particular "class IV laser therapy". Well-controlled clinical trials are unfortunately lacking, and much of the evidence for these procedures remains anecdotal. Mesenchymal stem cells (MSCs) have been used for a number of years to treat osteoarthritis. Their use has mostly been autologous (self); used fresh (in the form of a mixed cell population mainly sourced from adipose tissue), or expanded in number via culture; or allogeneic (non-self). The majority of their action via a paracrine effect, and hence the route of administration has been mostly via intra-articular injection. In vitro, this paracrine effect has been shown to enhance type II collagen expression in OA chondrocytes while decreasing matrix metalloproteinase activity (MMP-3 and MMP-13). In clinical cases, this has been shown via their anti-inflammatory/pain relieving effects. Dogs treated with adipose derived stem cell therapy have had significantly improved scores for lameness and compiled scores for pain and range of motion compared with control dogs. Other randomised studies have shown similar improved results with functional limitation, range of motion, and owner and veterinary investigator visual analogue scale for pain all showing improvement. Beyond this, significant improvements in MSC treated animals as measured by peak vertical force and vertical impulse in force platform have been observed. Patient-side autologous therapy in the US is subject to change. New guidance issued (FDA#218 Guidance for Industry - Cell-Based Products for Animal Use) will likely require stem cell therapy to be produced via cGMP. Resources required to implement these changes may change the US veterinary stem cell industry more towards a hub and spoke approach or towards allogeneic therapy, and away from patient-side therapy. If medications fail to maintain an adequate quality of life, surgical options may need to be considered. These may attempt to modify or repair the hip joint, in order to allow pain-free usage, or may in some cases completely replace it. Hip modification surgeries include excision arthroplasty, in which the head of the femur is removed and reshaped or replaced, and pelvic rotation (also known as triple pelvic osteotomy, or pubic symphodesis) in which the hip socket is realigned, may be appropriate if done early enough. These treatments can be very effective, but as a rule tend to become less effective for heavier animals - their ability to treat the problem becomes reduced if the joint has to handle more pressure in daily life. Pelvic rotation is also not as effective if arthritis has developed to the point of being visible on X-rays. Pubic symphysiodesis (also known as juvenile pubic symphysiodesis, or JPS), is a procedure for very young dogs that manipulates the way the pelvis grows to create a tighter hip. It involves cauterizing the growth plates of the pelvis, in other words, the part of the pelvis which would usually grow and spread in puppyhood, no longer does so. To compensate, the rest of the pelvis grows outward, in a manner which enhances the "socket" of the hip and provides better support than that dog would have had naturally. Since it relies on growth in puppyhood, it has a very tight window for surgery – currently no sooner than about 4 months and no later than about 5 months. This is compatible with hip scoring of puppies at 4 months. Osteoarthritis, a common symptom associated with canine hip dysplasia in German Shepherds ultimately results in pain and inflammation. The causes are from bone degradation in which the bone is less rigid, cartilage dissipates and structure of joints becomes weak. Diet can have a major impact for German Shepherds that are exposed to canine hip dysplasia. Incorporating omega-3 fatty acids such as docosahexaenoic acid (DHA) and eicosapentaenoic acid (EPA) into the diet can result in improved symptoms of the disease. Omega 3 fatty acids can help decrease inflammation that occurs from osteoarthritis, as well as improvement in locomotion of dogs who have the disease. EPA and DHA can be supplemented into the diet through fish oils and in return is beneficial for reducing joint inflammation. Glucosamine and chondroitin sulfate are nutraceuticals that can also be added into the diet to help treat osteoarthritis and its quality of life reducing effects. Both nutraceuticals help with improvement of cartilage, joint health and repairing of tissues. This inclusion will allow for a stronger support and reduced negative effects of osteoarthritis. Another nutrient that can help improve the structural support of the body in German Shepherds is vitamin C. Vitamin C contributes to the building blocks of collagen that can help to strengthen the joints. ^ a b Workingdogs.com. 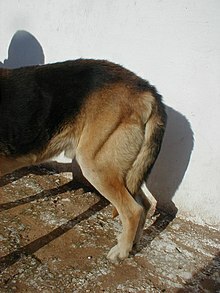 "Canine hip dysplasia". Workingdogs.com. Retrieved 2013-08-18. ^ Randall, David (Mar 23, 2014). "Ask The Expert Dr. Randall - Hip Dysplasia In Dogs". Youtube. Flexpet. Retrieved Nov 10, 2015. ^ Connor, J.R.; LePage, C.; Swift, B.A. ; Yamashita, D.; Bendele, A.M.; Maul, D.; Kumar, S. (2009). "Protective effects of a cathepsin K inhibitor, SB-553484, in the canine partial medial meniscectomy model of osteoarthritis". Osteoarthritis and Cartilage. 17 (9): 1236–1243. doi:10.1016/j.joca.2009.03.015. PMID 19361586. ^ Comhaire, FH; Snaps, F (March 2008). "Comparison of two canine registry databases on the prevalence of hip dysplasia by breed and the relationship of dysplasia with body weight and height". American Journal of Veterinary Research. 69 (3): 330–3. doi:10.2460/ajvr.69.3.330. PMID 18312130. ^ "Hip Dysplasia by Breed". Orthopedic Foundation for Animals. 2016. Archived from the original on 2010-10-19. Retrieved 2017-04-30. ^ "A number of environmental factors can affect the incidence of hip dysplasia in dogs - NVH". Veths.no. 2012-03-13. Retrieved 2013-08-18. ^ Torres; de la Riva, G; Hart, BL; Farver, TB; Oberbauer, AM; Messam, LLM; Willits, N; et al. (2013). "Neutering Dogs: Effects on Joint Disorders and Cancers in Golden Retrievers". PLoS ONE. 8 (2): e55937. Bibcode:2013PLoSO...855937T. doi:10.1371/journal.pone.0055937. PMC 3572183. PMID 23418479. ^ Lenehan TM, Van Sickle DC (1985). "Chapter 84: Canine osteochondrosis". In Nunamaker DM, Newton CD (eds.). Textbook of small animal orthopaedics. Philadelphia: Lippincott. ISBN 978-0-397-52098-5. ^ a b c d "Arthritis in the Dog". Vetrica.com. 2004-02-09. Retrieved 2013-08-18. ^ Terry DE, Rees-Milton K, Smith P, Carran J, Pezeshki P, Woods C, Greer P, Anastassiades TP (2005). "N-acylation of glucosamine modulates chondrocyte growth, proteoglycan synthesis, and gene expression". J. Rheumatol. 32 (9): 1775–86. PMID 16142878. ^ van Buul, G. M.; Villafuertes, E.; Bos, P. K.; Waarsing, J. H.; Kops, N.; Narcisi, R.; Weinans, H.; Verhaar, J. A. N.; Bernsen, M. R.; van Osch, G. J. V. M. (2012). "Mesenchymal stem cells secrete factors that inhibit inflammatory processes in short-term osteoarthritic synovium and cartilage explant culture". Osteoarthritis and Cartilage. 20 (10): 1186–1196. doi:10.1016/j.joca.2012.06.003. PMID 22771777. ^ Platas, J.; Guillén, M. I.; del Caz, M. D. P.; Gomar, F.; Mirabet, V.; Alcaraz, M. J. (2013). "Conditioned Media from Adipose-Tissue-Derived Mesenchymal Stem Cells Downregulate Degradative Mediators Induced by Interleukin-1β in Osteoarthritic Chondrocytes. Mediators of Inflammation". Mediators of Inflammation. 2013 (2013): 357014. doi:10.1155/2013/357014. PMC 3864089. PMID 24363499. ^ Black, L.; Gaynor, J.; Gahring, D.; Adams, C.; Aron, D.; Harman, S; Gingerich, D.A. ; Harman, R; et al. (2007). "Effect of adipose-derived mesenchymal stem and regenerative cells on lameness in dogs with chronic osteoarthritis of the coxofemoral joints: A randomized, double-blinded, multicenter, controlled trial". Veterinary Therapeutics : Research in Applied Veterinary Medicine. 8 (4): 272–284. ^ Cuervo, B.; Rubio, M.; Sopena, J.; Dominguez, J.; Vilar, J.; Morales, R.; Cugat, M.; Carrillo, J.M (2014). "Hip Osteoarthritis in Dogs: A Randomized Study Using Mesenchymal Stem Cells from Adipose Tissue and Plasma Rich in Growth Factors". International Journal of Molecular Sciences. 15 (8): 13437–13460. doi:10.3390/ijms150813437. PMC 4159804. PMID 25089877. ^ Vilar, J.M. ; Morales, M.; Santana, A.; Spinella, G; Rubio, M. N.; Cuervo, B.; Cugat, R.; Sopena, J.; Carrillo, J. M. (2013). "Controlled, blinded force platform analysis of the effect of intraarticular injection of autologous adipose-derived mesenchymal stem cells associated to PRGF-Endoret in osteoarthritic dogs". BMC Veterinary Research. 9 (1): 131. doi:10.1186/1746-6148-9-131. PMC 3716942. PMID 23819757. ^ "BioScaffold Reduces Pain and Lameness in Dogs with Osteoarthrits: July 2009 Report" (PDF). Trmatrix.xom. Archived from the original (PDF) on 2011-10-08. Retrieved 2013-08-18. ^ "Friday Find: Animal Assistance Products-For Pets Who Need a Little Extra Support". Fourgreensteps.com. 2012-02-17. Retrieved 2013-08-18. ^ a b Budsberg, S; Bartges, J (2006). "Nutrition and osteoarthritis in dogs: does it help?". Vet Clin Small Anim. 36 (6): 1307–1323. doi:10.1016/j.cvsm.2006.08.007. PMID 17085237. ^ a b c Johnston, S; Budsberg, S; Marcellin-Little, D; Toll, P; Caterson, B; Schoenherr, W; Roush, J; Allen, T (2005). Canine osteoarthritis. Clinician's update. pp. 1–12. ^ a b Bhathal, A; Spryszak, M; Louizos, C; Frankel, G (2017). "Glucosamine and chondroitin use in canines for osteoarthritis: a review". Open Vet J. 7 (1): 36–49. doi:10.4314/ovj.v7i1.6. PMC 5356289. PMID 28331832. ^ a b Richardson, D (1992). "The role of nutrition in canine hip dysplasia". Veterinary Clinics of North America: Small Animal Practice. 22 (3): 529–540. doi:10.1016/S0195-5616(92)50053-5. Connor, J.R.; LePage, C.; Swift, B.A. ; Yamashita, D.; Bendele, A.M.; Maul, D.; Kumar, S. (2009). "Protective effects of a cathepsin K inhibitor, SB-553484, in the canine partial medial meniscectomy model of osteoarthritis". Osteoarthritis and Cartilage. 17 (9): 1236–1243. doi:10.1016/j.joca.2009.03.015. PMID 19361586. Siegal, Mordecai (editor); UC Davis School of Veterinary Medicine Book of Dogs, 1995. Harper Collins. ISBN 0-06-270136-3. Slocum, B. & Slocum, T. D. DARthroplasty. In: Bojrab, M. J., ed. Current Techniques in Small Animal Surgery, 4th Ed. Baltimore: Williams & Wilkins 1998: 1168 - 1170.